The popular Mediator's Handbook presents a time-tested, adaptable model for helping people work through conflict. Extensively revised to incorporate recent practice and thinking, the accessible manual format lays out a clear structure for new and occasional mediators, while offering a detailed, nuanced resource for professionals. Starting with a new chapter on assessing conflict and bringing people to the table, the first section explains the process step-by-step, from opening conversations and exploring the situation, through the phases of finding resolution-deciding on topics, reviewing options, and testing agreements. Long a popular course textbook for high schools, universities, and training programs, The Mediator's Handbook is also a valued desk reference for professional mediators, and a practical guide for managers, organizers, teachers and anyone working with clients, customers, volunteers, committees or teams. Start reading The Mediator's Handbook: Revised & Expanded fourth edition on your Kindle in under a minute. Can you really make the classic book in its field even better? Authors Jennifer Beer and Caroline Packard prove the answer is a resounding "Yes!" Bravo! I have taught from previous editions for 25 years, and this new edition is even better, with new insights into conflict and new strategies that work. -- Susan Sgorbati, Director, The Conflict Resolution Program, Bennington College, Jones Chair for Social Activism. 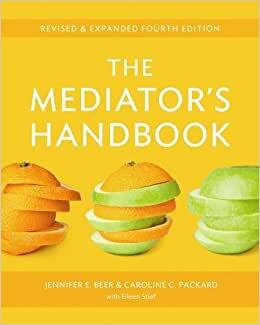 The Mediator's Handbook presents a time-tested, adaptable model for helping people work through conflict. Now extensively revised to incorporate recent practice and thinking, it lays out the process step by step, from first contact with the parties, to forging a resolution. The "Toolbox" section explains each concept and skill mediators need to guide the process, support the participants and help them reach decisions. Long a popular course textbook used by universities, high schools, and training programs, The Mediator's Handbook is also a valued desk reference for professional mediators, and a down-to-earth guide for managers, organizers, teachers and anyone working with clients, customers, volunteers, committees or teams. Jennifer Beer, PhD, an anthropologist, trainer, and facilitator, mediates in communities and organizations and teaches Negotiation & Dispute Resolution at the Wharton School. Caroline Packard, JD, a family and organizational mediator and trainer, led Friends Conflict Resolution Programs for fifteen years, and was before that a corporate litigator. Eileen Stief was a key early developer of the Friends Conflict Resolution Programs model on which the Handbook is based, and trained a whole generation of mediators.